No.1850 Squadron was formed at Brunswick, Maine, U.S.A., (H.M.S. Saker) on the 1st August 1944, as a single seat fighter and front line squadron, equipped with 18 Chance Vought Corsair Mk.IV aircraft, built by Goodyear at Akron, Ohio. The Maintenance crews sailed from the U.K. to New York and then to Brunswick. The Commanding Officer and Senior Pilot, sailed independently and eventually, all met up at Brunswick. The Royal Navy pilots, were all U.S. trained and joined the squadron, from Lewiston, Maine and Pensacola, Florida. The first casualty of the squadron was S/L. N. Shaw, who perished in a fire in one of the accommodation blocks on the 4th August 1944. In September 1944, the squadron were at Bar Harbor, Maine, practising 'ADDL's' (Aerodrome Dummy Deck Landings) and then to the real thing of 'DLT's' (Deck Landing Trials) aboard the American Carrier, U.S.S. Charger. On the 15th November 1944, the squadron was at Floyd Bennett Field, Brooklyn, New York. They then went to Norfolk , Virginia, ready for transit to the U.K., arriving and departing on the 23rd November 1944. Following the three and a half months of concentrated 'working up' procedure, the pilot's were now turned into a proficient team, ready to join the Fleet. The squadron sailed from Norfolk, Virginia, absorbing part of the disbanded No.1849 Squadron and increasing No.1850 squadron to 24 aircraft, in H.M.S. Reaper, a Ruler Class Ferry Carrier (D82, ex-USS. Winjah CVE-34) arriving at H.M.S. Gadwall, Belfast, Northern Ireland on the 6th December 1944. The squadron then went to H.M.S. Gannet, R.N.A.S. Eglinton, near Londonderry, Northern Ireland, arriving on the 27th December 1944, for further 'work up' and 'deck landing practise'. The squadron then went to an R.A.F. base at Ayr, Scotland, (H.M.S. Wagtail) arriving on the 13th January 1945. On the 10th February 1945, No.1850 squadron joined H.M.S. Venerable (R04 Colossus Class Light Fleet Carrier) for further 'DLT's' (Deck Landing Trails). There was some confusion, as No.1850 squadron was already destined for H.M.S. Vengeance, although the squadron was ready, the ship was not. In the case of H.M.S. Venerable, the ship was ready, although her squadron was not, thus, No.1850 squadron had a temporary stay with H.M.S. Venerable and continued training in the Firth of Clyde. The second casualties for the squadron came on the 23rd February 1945, in the Clyde Approaches, two aircraft failed to return from a dawn Formation Practise, both S/L. C. Macey and S/L. P. Hudson, were lost. The Deck Landing Trials, aboard H.M.S. Venerable, were filmed by the Royal Navy and are now housed in the Imperial War Museum Film Archive. (MTE 1838). On the 25th February 1945, No.1850 squadron transferred from H.M.S. Venerable to H.M.S. Vengeance (R71 Colossus Class Light Fleet Carrier) forming the 11th Aircraft Carrier Squadrons, with No.812 Squadron, intended for the British Pacific Fleet. Due to German U-boat activity in the Clyde Approaches and Irish Sea, (U-1302) it was decided that H.M.S. Vengeance should be diverted to the Mediterranean. At 12.45hrs. on the 12th March 1945, H.M.S. Vengeance, together with the other members of the 11th ACS (Aircraft Carrier Squadrons), H.M.S. Colossus, H.M.S. Glory and H.M.S. Venerable, escorted by the Destroyer Escorts, H.M.S. Tartar , H.M.S. Cotton, H.M.S. Inman, H.M.S. Assiniboine, H.M.S. Stockham and H.M.S. Ulysses, left the Clyde and sailed around the North, then West coasts of Ireland towards Gibraltar. On the same day U-260 was sunk off Fastnet Rock, South of Ireland, which may have been waiting for the Fleet. No.1850 squadron's first 'active' base was at H.M.S. Falcon, R.N.A.S. Hal Far in Malta, arriving on the 19th March 1945. From there, the squadron flew their first exercises over Sicily, commencing on the 29th March 1945. On the 5th April 1945, aircraft from No.1850 squadron escorted No.812 squadron (Barracuda Mk.II's) to Syracusa, Sicily on practice bombing raids. On the 6th April 1945, the squadron suffered another casualty, when returning to Hal Far from an Interception Exercise, S/L. E. Bardner, bailed-out from his aircraft, possibly due to low oil pressure, and was never found, despite a lengthy air and sea search. No.812 squadron also encountered loss on the night search, for S/L. Bardner. Pilot S/L. J. Birch, Observer S/L. D. Robbins and TAG L/A. H. Hamill failed to return from the search. No.1850 squadron remained at Hal Far until the 23rd April 1945, when they returned to H.M.S. Vengeance in Valletta Harbour, celebrating 'VE Day' on the 8th May 1945, in Malta. Although the War was officially over in Europe, it was still continuing in the Pacific and this where No.1850 squadron was heading. On the 11th June 1945, the squadron's next base was at H.M.S. Valluru, Tambaram, Madras, and H.M.S. Garuda, Coimbatore, Cochin, in Southern India, where they took part in new weapon training, air gunnery and dive bombing practice, returning to H.M.S. Vengeance on 1st July 1945. The next base for No.1850 squadron was H.M.S. Nabswick, Jervis Bay, Australia, (MONAB V) arriving on the 22nd July 1945. The squadron remained there in readiness and continued 'working up' procedures in the Pacific. Now at the peak of efficiency and raring to go, until the 13th August 1945, when they returned to H.M.S. Vengeance, which was anchored in Sydney. With the end of the War imminent, there was a rush to get Squadron's re-embarked onto their respective Carriers. The squadron was briefed for an Operation against a Japanese held Island called Truk, which was still heavily defended. The 11th ACS (Aircraft Carrier Squadron's) was ultimately destined to cover the Invasion of Japan. On the 15th August 1945, (VJ Day) the Pacific War ended, some of the squadron considered this an anti-climax, for all their hard training, there were no celebrations this time for the squadron's or ship's, as they left Australia, in company with H.M.S. Indomitable, H.M.S. Colossus, and H.M.S. Venerable, followed by cruisers H.M.S. Bermuda and H.M.S. Swiftsure, destroyers H.M.S. Quadrant, H.M.S. Tuscan, H.M.S. Ursa, H.M.S. Tyrian, H.M.S. Kempenfelt and H.M.S. Whirlwind. In order to keep aircrew personnel in flying practise, it was decided to disembark No.1850 squadron to an airstrip at Ponam in the Admiralty Isles, the British Pacific Fleet forward Operating Base, arriving at H.M.S. Nabaron (MONAB IV) on the 23rd August 1945. This was soon curtailed and the squadron returned to H.M.S. Vengeance on 30th August 1945. No.1850 squadron was then sent to Hong Kong, arriving on the 3rd September 1945. It was rumoured that Japanese suicide boats were awaiting the Fleet and the following Japanese ships were in the Hong Kong area at that time, SAGA, MIAKO and HATUKARI. The squadron were based at H.M.S. Nabcatcher, Kai-Tak Airfield (MONAB VIII), in Kowloon, to take the surrender of the Japanese Forces and to give aid and Policing duties, the squadron being reduced to 12 aircraft at this time. The 1st and the 11th ACS (Aircraft Carrier Squadron's) were amalgamated into the 1st ACS. The squadron remained there for almost the rest of the year, leaving on the 28th December 1945. There is a plaque, dedicated to the officer's and men of H.M.S. Vengeance, who liberated the Royal Hong Kong Yacht Club, from the Japanese Forces. The squadron's next base was at H.M.S. Nabthorpe (MONAB VI) at Schofields, Sydney, Australia, arriving on the 12th January 1946, where No.1850 squadron remained, until the 19th March 1946, due to H.M.S. Vengeance being in dry dock for repairs. H.M.S. Vengeance and her squadron's, were transferred from the British Pacific Fleet to the East Indies Fleet and subsequently sailed for Ceylon. No.1850 squadron's last base was at H.M.S. Ukussa, Katukurunda, Ceylon, arriving on the 5th April 1946, this was to be the final Squadron base for No.1850 before leaving for home on 11th June 1946. On arrival at Gosport on the 12th August 1946, No.1850 squadron was disbanded, which coincided, with the end of the First Commission of H.M.S. Vengeance. 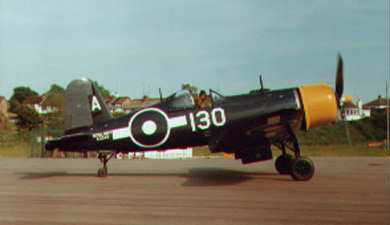 The squadron number, was earmarked in 1953, for a post-war Royal Navy Volunteer Reserve Squadron, but this became No.1843 instead.